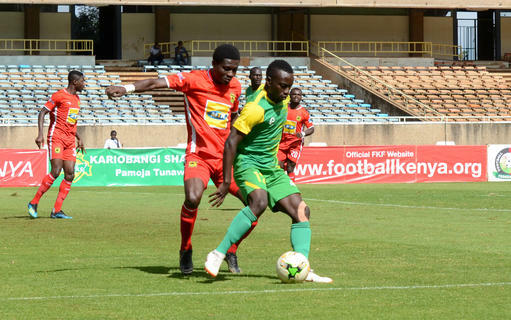 Kariobangi Sharks are left with a massive final to play in Kumasi next weekend after being held to a 0-0 draw by Ghana’s Asante Kotoko in the first leg of the CAF Confederations Cup first round at the Kasarani Stadium on Saturday evening. The draw means that in the least Sharks can advance to the second round if they manage any scoring draw in Kumasi. It was a hands back approach from the two sides and none wanted to have a go in the opening 15 minutes. Duka Abuya had the first shot at goal on 15 minutes but it sailed straight to the keeper. James Mazembe and Harrison Mwenda too had chances with shots, but both were too easy for the Kotoko keeper to pick out. Kotoko’s first chance of the game came after 20 minutes when Emmanuel Gyamfi made a decent run on the right skipping beautifully past his marker, but his eventual cut back after running into the box was cut off by the Sharks defense. They had another chance after 36 minutes when Maxwel Baako’s freekick from the right was nodded into Martin Antwi’s direction at the edge of the six yard box but his attempt at goal was direct at Brian Bwire in the Sharks goal. Two minutes on the turn, Kotoko defender Agyemang Badu was forced to clear the ball off the line after James Mazembe’s effort off a Harrison Mwendwa cross skipped past the keeper. On the other end, Emmanuel Antwi had a chance when Gyamfi’s well measured cross off the left landed on his path, but his header was over with no pressure on his back. The second half was a more balanced affair with minimal scoring chances. The two sides changed personnel, Yacouba Songne coming on for Kotoko for Naby Keita while Sharks brought in Henry Juma for Mazembe. The Ghanaian side sought to slow down the game at every opportunity, going down on every challenge to eat a few minutes off the clock. Sharks coach Muluya made more attacking changes, Moses Mwangi coming in for Wasambo to spice up things with a bit of speed. Kotoko threatened especially through new man Songne, but they couldn’t find the back of the net. They came close with few minutes left on the clock when Gyamfi’s shot from distance went inches over the bar.